Action to be taken by the present (new) govt ! You always make pioneer efforts in various fields and in this context I would like to suggest that why not we seek suggestions/recommendations from our associates on the action to be taken by the present (new) govt. in various spheres which will make their respective colonies and surroundings an enviable one! Received suggestions etc. may be collated and presented by you in a proper format to the present Govt. or even route it through our Hon'ble Minister Dr. Harsh Vardhan, whom you may be knowing intimately! If you agree, I will make an attempt and send it to you from my side what is required to be done - say a wish list - in respect of our colony! Labels: Action to be taken by the present (new) govt ! and also the dumped vehicles must be removed early from the Parking lot. It will create space for more vehicles to park comfortably. These are a few suggestions to be implemented as soon as possible in easing a bit of the parking problems. Family should also be restricted in keeping more than one vehicle in a flat. And for existing MULTIPLE Carsin OneFamily: Ultimatum to SALEoneCar..KeepOne Vehicle Per Family. Use CarPooling. Pedestal REFORMS should be done to facilitate BICYCLE usage. RWAs must promote BICYLE usage in respective localities for local shopping upto 3-4kms. Disturbance because of a low pressure over western U.P. Strong North Western winds ravaged the Capital on Friday evening at 92 kilometres per hour, killing nine people and damaging three aircraft and scores of vehicles. Twelve people were also reportedly injured. The disturbance dragged down the mercury and threw the city out of gear. The storm, accompanied by rain and lightning, which struck at 4.58 p.m., was because of a low pressure over Western Uttar Pradesh and neighbouring areas. Power supply was badly hit in most areas due to trees and branches falling over transmission lines and consequently power plants getting tripped. Rishi Raj of Delhi Transco said that these include the Dadri-Mandola, Ballabhgarh-Bamnauli, Jhatikara-Mundaka, Bawana-Abdullapur, Bawana-Bahadurgarh, Wazirabad-Geeta Colony, Mandola-Gopalpur, Mandola-Wazirabad and Bamnauli-Rohini of Delhi Transco and Power Grid. This also led to metro and railway services getting hit. While metro services were struck stranded for an hour, more than 100 trains were delayed. “Some local trains were cancelled and long distance trains were delayed between thirty minutes and three hours due to power disruption. Trees have also fallen on the Rohtak, Ambala and Rewari lines. The power cable over the Ghaziabad- Delhi route has also broken,” Neeraj Sharma of Northern Railway said. Power discoms claimed they were working to restore power supply to the city before midnight. Worried commuters returning from office were seen flagging down vehicles for a lift. In the Central Secretariat's Shastri Bhawan, a large branch damaged three cars and glass shards fell over passers-by here and at Jharkhand Bhawan in Vasant Kunj. 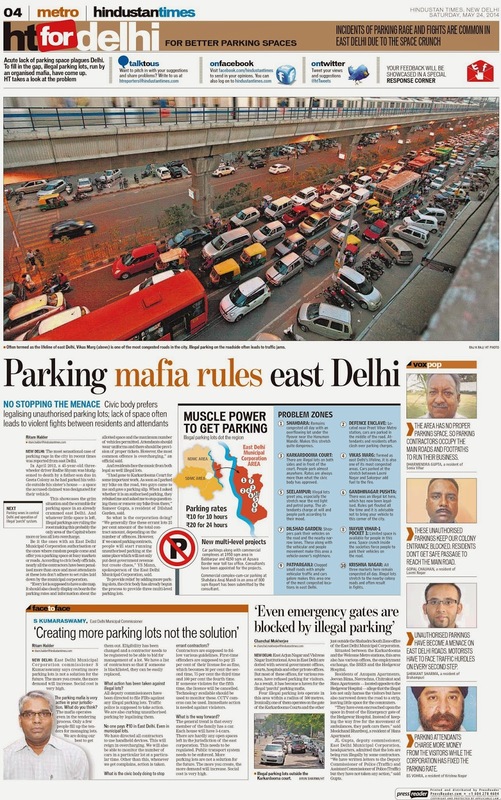 Police barricades that had brought massive rallies to a halt with seen strewn over New Delhi district. “My clothes are flying all over Chittaranjan Park as my maid left them on the terrace,” media professional S. Ashok wrote on a social networking site. The rain evaporated soon after the storm stopped leaving an eerie semblance of normality although the city of djinns remained a mess that will take all weekend to clean. However, water logging was reported in low lying areas. 1) the new houses being built must have in-built parking facility. 2) permission to buy new vehicle must be given only after confirming the availability of parking space. 3) there may be some restriction on the entry of number of vehicles from the neighbouring states. 4) necessary infrastructure as alternative to using personal vehicle may be developed. 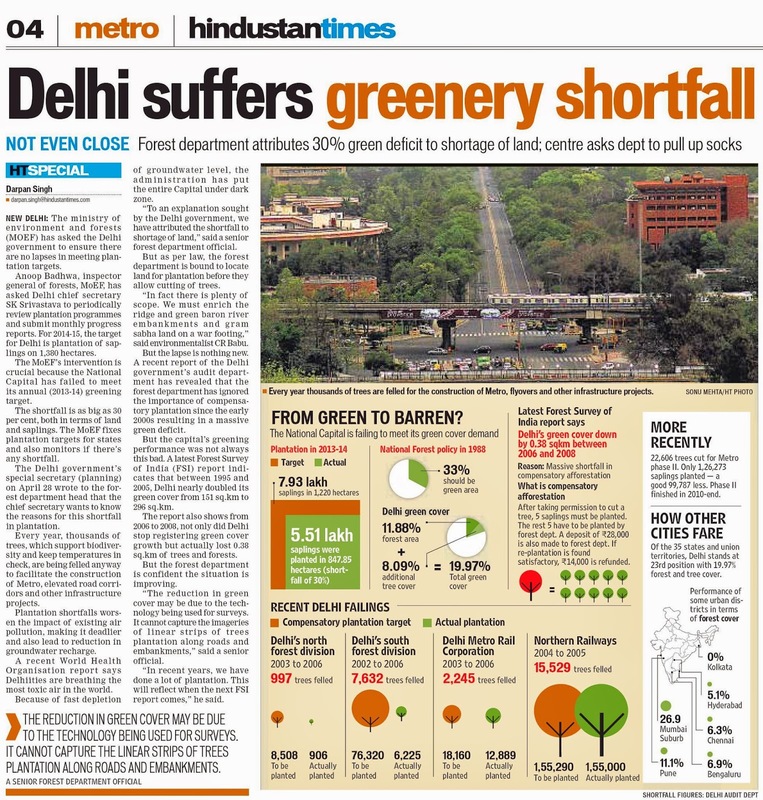 After most Polluted city Tag - Now a shortfall in Greenery ? Labels: After most Polluted city Tag - Now a shortfall in Greenery ? www.flourishingproperty.com - A Property web Portal offering Residential & Commercial Builders Apartments. Please log on to view 12% Assured returns till possession on the Commercial properties on various locations alongwith Capital appreciation. Heartiest congratulations on our representative becoming an Union Minister for Health!! Excellent projection of compilation! Heartiest congratulations on our representative becoming an Union Minister for Health!! Hope Delhi's health - politically, socially and administratively - will improve further on his elevation! On an introspection it is felt that our representatives could achieve many things and overcome many problems of the citizens of Delhi if they could ensure that all the officials and staff, right from the top to bottom, are made to work and respond to the genuine grievances of the citizens and redress them expeditiously! It is a pity that all our representatives, right from Councillor to our MP, not to talk of any Minister at the state or union level, do not even ack. e-mails sent to them, which is a faster and most economical way of communication, not to talk of response! They are only, I am extremely constrained to record, fond of and seeking felicitations, attending high-tea parties and making laudable speeches from public platform, rather than devoting time and energy to the problems of the 'aam aadmies' who could hardly approach them! Why can't they have staff to attend to such mails and ack/respond to them. They can also seek the assistance of 'volunteers' if necessary to help them in this respect. For instance yesterday I happened to attend a felicitation function at Karkarduma in honour of our hon'ble MP, by whose sides all our MLAs and Councillors stood by, there was a milieu and a great crowd of all important persons, including citizens but could not maintain a decorum and decency and ack. the role played by the voters in making them elected! I am extremely pained to ink this, but could not help it. Most of them were squatting over the area for 'sumptuous lunch' perhaps gossiping with each other and not caring to even offer seats to 'senior citizens' of our age! This is the culture, unfortunately, we are fond of and we don't wish to celebrate such occasions in a better and befitting fashion! Perhaps my mindset was different? Even before election of the Councillor and MP and after their elections too, I had sent mails congratulating them and took the occasion the perenial problems of our area which are all pending over a long period of time but not even they were ack. not to talk of a response. This is the state of affairs. You have to be constantly and consistently in touch with them and approach them time and again in person and greet them etc. failing which you cannot even think of solving your problems! When the day will come when they will respond to your communications and resolve the problems? I am not a pessimistic but an optimist! Let's watch and wait for better times! Labels: Heartiest congratulations on our representative becoming an Union Minister for Health!! In a defamation suit filed by Gadkari for declaring him most corrupt, court has sent Arvind in jail for two days, as he refused to furnish bail of R 10000/-. The case will now be heard on 23rd of May. AAP volunteers clashed with police outside the jail late in the evening of 21st while all senior leaders sat on dharna outside. Whatever may be the cause for sticking to its principles but people have not appreciated his approach. Is he trying to hog the limelight and media space while preparing for the forthcoming assembly polls in Delhi? If so it will not give him electoral dividends. People want him to behave with maturity in a dignified way and take up people centric issues like infrastructure, unemployment and inflation. People are fed up with his street theatrics and policy of confrontation. Elections cannot be won on the issue of corruption alone. Though corruption is an issue but inflation, unemployment and security are the priority issues to be tackled first. By and large people are adjusted to the prevailing corruption and they know it cannot be eliminated fully, at best it can be contained hence it is not a major electoral issue. AAP leaders should adjust to the winds of change. Hard-line approach is not appreciated. Policy of conciliation, compromise and adjustment within the prevailing circumstances is the need of the hour. Drubbing received in recent elections conveys a lesson and should be read properly. The message is loud and clear people have rejected AAP’s policy and approach. They want him to change its strategy. AAP supporters still have lot of hopes from Arvind, hence would not like to see him on a path of self-destruction. Let us hope better sense prevails and he fulfils aspirations of millions of its volunteers and supporters. Please log on to www.flourishingproperty.com for Investments in Property with Assured returns. Please log on to www.flourishingproperty.blogspot.in for subscribing the Free Property News Letter with regular updates. I live in DLF phase 3, and we have been without electricity since 11pm on Tuesday. Various agencies working under DLF give differeing reasons for the blackout, and all promise have been promising electricity within an hour - for the last 36 hours. The newspapers seem to have developed a concern for the feelings of DLF, so though the blackout is mentioned with regard to Gurgaon, DLF has been very considerately left out of the report. I suppose the print media have a very soft spot for DLF. Can someone tell DLF that this is 2014, and that electricity is not something that is to be given as a kind benediction! Bad Roads at Inder Enclave, Nangloi ! I am living at A-190/4 Inder Enclave Phase – I Nangloi Delhi-110086 our society’s roads are in very bad condition and due to this drain water blocked in road and people are facing problem to going anywhere.So are requested you please prepare the our society’s lane number 04 and get resolve the such issue. Labels: Don't be a silent spectator. Say something ! Not a silent spectator ! POLLUTION:- THE REMEDY IS HEAVY PENALITY ON DEFAULTER. REMOVE ROAD SIDE WORKSHOP. STOP INDUSTRIAL WASTE GOING TO RIVER. DEFAULTER LICENCE MAY BE CANCELLED ON 2ND DEFAULT. 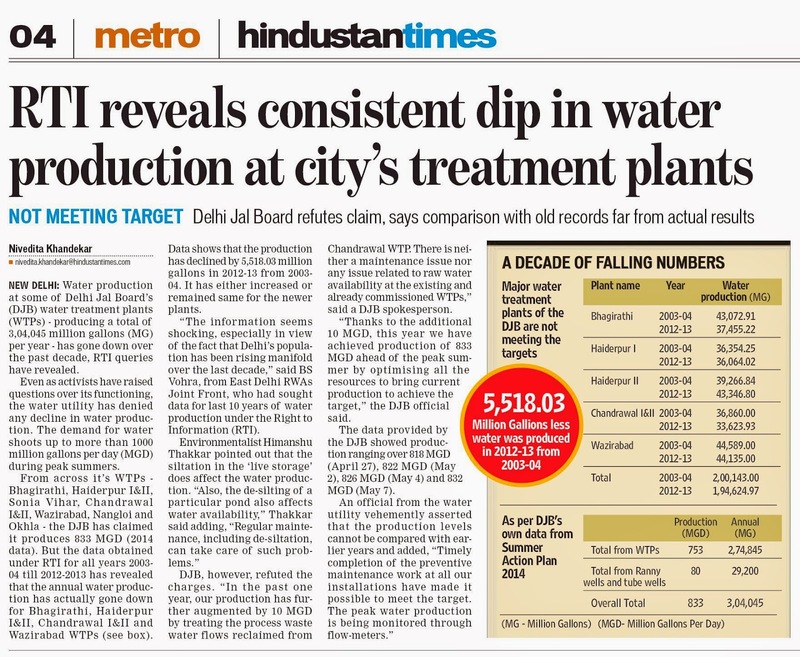 DRINKING WATER:- FIELD UNITS OF DELHI JAL BOARD MAY BE STRENGTHEN. LEAKAGE MAY BE RECTIFIED WITHIN 24 HOURS. DJB SHOULD START CENTRAL CONTROLL ROOM FOR LEAKAGE AND MONITOR. COOPERATIVE GROUP HOUSING SOCIETY IS NEXT DEFAULTER AS PEOPLE HAVE NOT PUT VALVE ON WATER TANK WATER OVERFLOWS AND GOES TOB SEWERLINE.IF INDIVIDUAL METER IS INSTALLED INCOOPERATIVE GROUP HOUSING SOCIETY WASTAGE WILL BENEGLIGIBLE AS EACH ONE HAS TO PAY NOE IT IS COLLECTIVE PAYMENT NO BODY THINKS OF WATER CONSERVATION.NEXT IS JHUGGI CLUSTER WHERE WATER OVERFLOWS AS THEY DONOT HAVE TO PAY SO NOBODY BOTHERS. POWER TARIFF:- POWER THEFT IN JHUGGI CLUSTER FACTORY AREA AND NOTORIOUS RESIDENTIAL AREA IS CONTROLLED THAN NO NEED FOR POWER TARIFF HIKE. POWER BREAKDOWN:- ALTHOUGH POSITION IMPROVED BUT CAN BE FURTHER IMPROVED BY INSTALLING NEW EQIPMENT BY REPLACING AGE OLD EQUIPMENT. REFORM IN DELHI GOVT:- RWA, CGHS FEDERATIONS CAN PLAY VITAL ROLE. GOVT SHOULD TAKE SUGGESTIONS FROM THESE BODIES AND WORK ON THEM. Don't be a silent spectator. Say something ! Don't be a silent spectator. 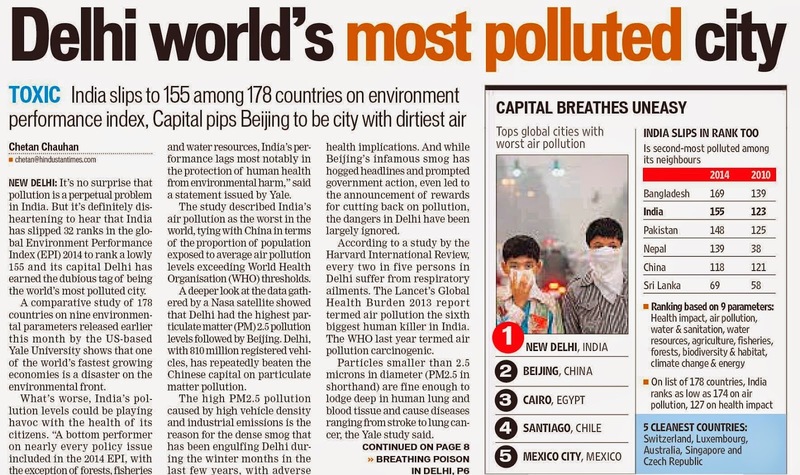 Please say something on Pollution in Delhi, on Drinking Water & Power Tariff in Delhi, on Power Breakdowns in Delhi, on AAP's try to reform the Govt. in Delhi, etc. etc. Plz say something & mail us now. About 3,000 families living in slums of Kalkaji and Govindpuri are set to get swanky new homes, courtesy the Delhi Development Authority's (DDA) new housing project. After rehabilitating residents of the Kathputli Colony in the Capital, the slum dwellers of South-east Delhi are next on the land-owning agency's list. According to DDA officials, this new housing society has been named the Kalkaji In-Situ Housing Society and is located at Govindpuri Main Road in Kalkaji Extension, near the Bhoomi-Heen Camp. The project will cost approximately ` 232 crore and is expected to be completed by the end of 2016.
with thanks : indiatoday : link : for detailed news. Narendra Modi’s victory in the Indian election is expected to improve trade ties between New Delhi and Washington and could eventually lift U.S. exports in industries ranging from pharmaceutical products to heavy infrastructure, U.S. officials and business leaders say. Narendra Modi addresses a public rally Friday after his party won its biggest victory in 30 years on promises to revitalize the economy. On Friday Mr. Modi, whose pro-business credentials during Gujarat’s rapid economic expansion have already lifted India’s stock market, led his Bharatiya Janata Party toward an apparent victory that could make him prime minister later this month. Depending on which officials join his government, U.S. companies could benefit from a relaxing of recent policies that promoted Indian manufacturing and intellectual property at the expense of international rivals, U.S. business groups say. “Looking at his reputation and track record in Gujarat, there were some good signs from his tenure there,” said Linda Dempsey, vice president of international economic affairs at the Washington-based National Association of Manufacturers, a trade group. with thanks : WSJ : LINK : for detailed news. In a major initiative, Delhi Government has proposed that rent and lease deeds will be based on the circle rates of properties, a move aimed at mopping up more revenue and curbing tax evasion. As per the proposal moved by the Revenue department, stamp duties on lease deeds and rent agreements will be calculated as per existing circle rates of an area and no under valuation of properties will be allowed. Divisional Commissioner Dharampal said that circle rate may be applicable on properties whose tenure of rent agreement is more than one year. "Often the real rent amount is not shown to save on stamp duties. We are planning to impose taxes on rented properties based on circle rate of a particular area," he said. Sources said 2 to 5 per cent circle rate may be imposed on rented properties which may raise the rents of commercial properties in areas like Khan Market, Connaught Place and Greater Kailash. Is Delhi on the verge of a massive Cancerous DISASTER ? Labels: Is Delhi on the verge of a massive Cancerous DISASTER ? Plz share pics of RWA Events & Celebrations ! 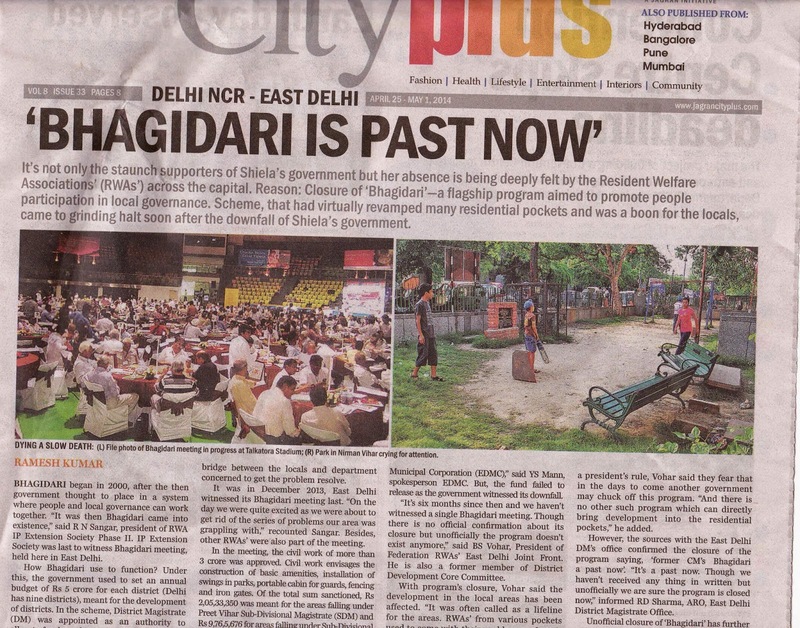 Plz share pics of RWA Events & Celebrations from anywhere in Delhi / NCR for uploading on the RWABhagidari Blog. Awaiting your valued response. You can use the Contact form on the Top Left to contact us. NEW DELHI: Delhiites risk a season of outages from June, with the Supreme Court lifting its stay restraining NTPC from snapping power supply to the BSES discoms. 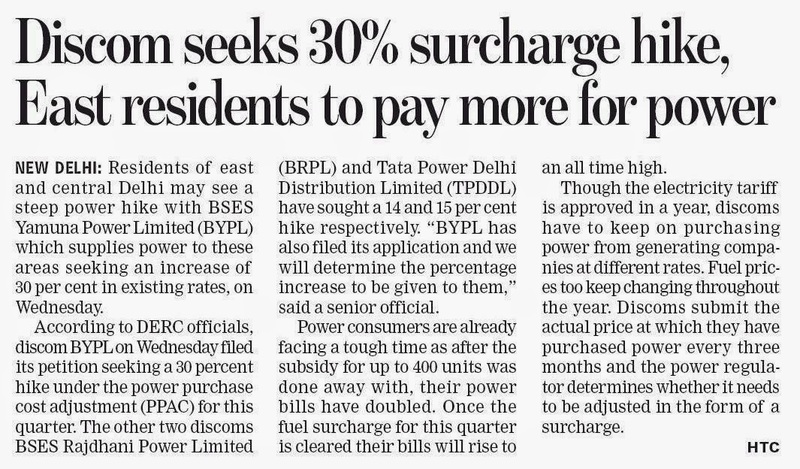 BSES Rajdhani and BSES Yamuna, which distribute power to east, west, south and parts of central Delhi, are still trying to make payments to NTPC and indicate that they may not be able to meet the new deadline. NTPC supplies over 2,000MW to the city and regulating the supply will affect thousands of households. The discoms serve about 34 lakh households or 70% of Delhi. BSES Rajdhani distributes power to over 18.5 lakh consumers in south and west Delhi, including Alaknanda, Vasant Kunj, Saket, Nehru Place, Nizamuddin, Sarita Vihar, Hauz Khas, RK Puram, Janakpuri, Punjabi Bagh, Tagore Garden, Vikaspuri, Palam and Dwarka. BYPL's consumer base includes Patparganj, Karkardooma, Mayur Vihar, Jungpura, Laxmi Nagar, Preet Vihar, Seelampur, Mausam Vihar, Anand Vihar, Vasundhara Enclave etc. The Supreme Court has told India's top power producer NTPC that it can cut supplies to New Delhi's electricity distributor BSES if it is not paid arrears by end-May, intensifying a dispute that could lead to blackouts in the capital. The court on Tuesday ordered BSES - part of billionaire Anil Ambani's Reliance Infrastructure - to pay state-run NTPC the Rs 7 billion ($116 million) it is owed by May 31. If BSES fails to pay by the end of May, the court said, NTPC is entitled to cut the power it supplies to the distributor, overturning an earlier court order that NTPC should keep power flowing despite the outstanding bill. BSES did not immediately respond to a request for comment. It has previously said lower tariffs and a revenue shortfall meant it could not pay. The case in Delhi reflects a growing battle over who should bear the rising cost of power in India. On the one side are many consumers who consider cheap or free power to be a right and want tariffs kept low. with thanks : business today : LINK : for detailed news. No Delhi Sarkar - No Bhagidari ? Labels: No Delhi Sarkar - No Bhagidari ? But why East has to pay more ? Labels: But why East has to pay more ? No Govt & none listens ! Re: Development of Green belt in Anand Vihar – works to be carried out. 1. Cutting/pruning of ‘safeda’ trees etc. which are endangering the life and property in the colony, as they are outgrown and titling in a dangerous condition. These also prevent sunlight direct to the ground and growth of grass and plants, besides dirtying the entire belt with dead leaves etc. Some of them are leaning towards the compound wall, which help the miscreants to jump over to the colony causing thefts/dacoity etc. Urgent steps be taken to do the needful in consultation with the Forest Dept., if necessary. 2. The official concerned may please be directed to spurn up the entire area and plant seasonal flower-plants etc. to beautify the entire stretch at the earliest. 6. We must thank the Electrical Dept. and record a note of appreciation for providing ‘Garden lights’, all over the Green belt, which not only beautifies the place but also facilitates ‘walkers’ to stroll in the nights too! May we request you to kindly look into the above and take expeditious action on all the aspects stated herein, before the spring season ushering in to gladden the hearts of the residents residing in Anand Vihar! With deep regards and best wishes for the ensuing New Year!